As we move into the end of the year, the days are becoming shorter, which means, for many motorists, more time spent driving at night. It is estimated that fatalities from automobile accidents are three times greater at night than during the day. Whether you are a seasoned night owl, or an occasional night-time driver, we have a refresher course of sorts for driving at night. Check your headlights. Be sure that your headlights are working and that they are positioned correctly. Your lights should not be pointed toward the ground, but straight ahead. In addition, check your headlights for oxidation, which will force your lights to appear dim. You can deoxidize your headlights with specialized cleaning products that should be available at any auto parts store. Clean your windshield and mirrors. To avoid streaks that can cause a reflective glare, use newspaper instead of paper or cloth towels. Be sure to clean both the interior and exterior of your windshield. Consider installing fog lights. High beams will obstruct your view in the event of fog. Fog lights are designed to project light lower to the ground to aid your vision in the haze. If you do not have fog lights, only use your low beams when in a fog. Dim your dash lights. If your dash lights are on the highest setting, you could become distracted by the brightness, or even temporarily blinded when glancing at the dashboard. Visit your eye doctor. If you have not been to the optometrist in the past year or so, schedule a checkup. If you require glasses or a different prescription, ask for the anti-glare lenses. Reduce your speed. Even with high beams working, you will be driving under low visibility that greatly affects your peripheral vision. So while you might be able to see directly ahead of you, you are not able to see, and therefore anticipate, possible cars, objects or animals that might cross your path, giving you less time to react and break to avoid a collision. Scan the road. Do not fixate on one section of the road while driving at night, but scan back and forth. This can help with your peripheral vision, as well as keep you alert. When an on-coming car passes you, temporarily focus on the right edge of the road. To avoid being blinded by another car’s lights, divert your gaze to this section of the road until it passes. This will allow you to maintain your position without unintentionally swerving off the road. Minimize distractions. As stated before, your reaction time might be delayed due to visibility while driving at night. By minimizing distractions, such as talking, eating or drinking, you can remain alert and focused on the drive ahead. Listen to your body. If you are exhausted, you cannot drive completely focused, and even run the risk of falling asleep behind the wheel. The CDC estimates that up to 6,000 fatalities are related to driver fatigue each year. If you find yourself yawning or blinking excessively, or know that you are exhausted, pull over and rest. 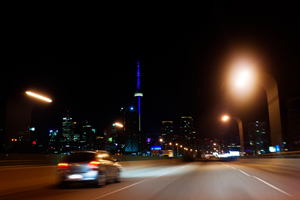 We hope that you keep these tips in mind the next time you find yourself driving at night. If you do find yourself involved in an accident, be sure to find representation from an experienced personal injury attorney. Contact KBG for Results You Deserve®.